Candied citrus peel is often identified as a tasting note in light, fruity whiskies, but have you ever considered pairing a dram with the fruit? Martine Nouet considers the possibilities. Candied or fresh: citrus fruit pairs well with whisky in whatever form. Usually a summertime staple, citrus fruit is now widely available all year long, helping to deliver health benefits during the cold and sun deprived winter months, and refreshment during the heat. 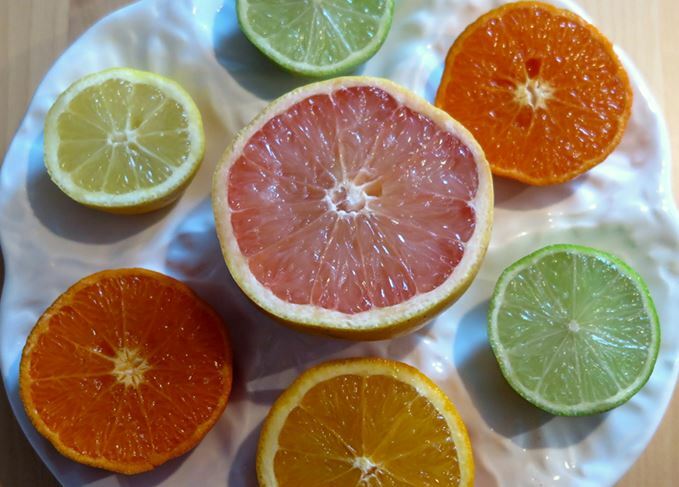 While the humble orange, lemon and lime are among the most popular citrus available, there is an incredible variety of fruit that offers a large array of tangy flavours, from slightly sweet to clearly sour and sometimes with a bitter edge. The fruit itself – which belongs to the Rutaceae family – has many different culinary uses for the juice, the pulp and the zest. Quite clearly, not many fruit are so versatile and, as the icing on the cake, they pair wonderfully with a certain type of whisky – more on which below. It is interesting to note that new varieties regularly appear on the market, resulting from subtle cross breeding between different types of citrus. There is also a fashion for the exotic, initiated by chefs, like the infatuation for Yuzu, the Japanese citrus. Of course Yuzu and others like bergamot, kumquats or ugly are not common in many western countries, but some well-stocked supermarkets will store them from time to time – keep an eye on the exotic food departments. You can also find preparations based on these rare fruit such as Ponzu sauce made from Yuzu, marmalade made from bergamot or candied kumquats. Let's review a selection, from the most common to the rarest. Originating from North India, the lemon is oval and yellow or yellow/green. Tart and tangy, lemons are rich in juice and their zest enhances savoury dishes as well as sweets. It keeps well in the fridge. The best lemons come from Sicily or the French Riviera (Menton). This is the fruit to always have at home and not only for your G&T. I prefer it to lemon for cooking as, lusciously perfumy, it imparts a kind of floral/tangy flavour to the dish. Limes originally come from Malaysia but they are now widely grown in tropical and subtropical regions. Some varieties called sweet limes will have a higher content of sugar, though lime is rather acidic. Key limes are smaller and tarter, closer to lemons in taste. The most common citrus fruit with lemon, oranges are a hybrid between pomelo (25%) and mandarin (75%). Known in China from 300 BC, they are grown in tropical and subtropical regions, including Mediterranean countries. Depending on the culinary use, one will choose between table oranges such as Navel (sweeter), cooking oranges such as Séville oranges (bitter, for marmalade) or oranges for juice such as Valencia (also sweet). Blood oranges (also known as Maltese and ‘orange sanguine’ in French) are very juicy and virtually seedless, with a delicate fruity flavour – all qualities which make them interesting to cook with as well as enjoy at the table. Their colour is given by a high concentration of a natural pigment called anthocyanin. The best blood oranges come from Tunisia. Mandarin resembles the orange but is smaller, full of seeds and generally sweeter. Mandarin is often a ‘parent’ in crossbreeding. The tangerine is a variety of mandarin, with a sweeter and stronger flavour. Satsuma is another variety of mandarin. We tend not to differentiate them but in fact they are two separate fruit, the grapefruit being the result of crossbreeding pomelo with orange. The visible difference between the pomelo and the grapefruit is their skin – thin and yellow or pink for the grapefruit, and thick and yellow/green for the pomelo. Their flavours range from very acidic to sour, and from sweet to tart. Also belonging to the ‘orange’ family through crossbreeding are smaller fruit such as the Clémentine, a hybrid between an orange and a mandarin that was created by father Clément, a missionary in Algeria. Seedless and sweet, clementines are delicious to eat on their own but also in salads or sorbets. Minneola is also a cross between a tangerine and a grapefruit, with a mildly tart taste. The kumquat is like a small oval orange. The interesting part is the peel, which is very aromatic. It’s good to add to a fruit salad or to cook in syrup for making candied kumquat (which is wonderful in a chocolate cake). What a basket to choose from for pairing with whisky! It is no surprise that citrus fruit combine well with single malts matured in Bourbon casks. The matching conveys a comforting and refreshing sensation of youth and liveliness both on the nose and palate, achieving a good balance between the vanilla sweetness of the whisky and the tangy tartness of the fruit. Especially if the whisky is peated. In fact, the matching borders on perfection. There is an intimate mingling between the smoke and iodine on one side, and the juicy tang of a lime, lemon, orange or grapefruit. We are talking fresh fruit here, though with candied fruit Sherried whiskies win the game because the harmony is based on the sweetness of both. Some ideas? A simple citrus fruit salad (lime, grapefruit, orange, satsuma, kumquat) enhanced with a pinch of pepper and two tablespoons of a peated whisky (Ardbeg or Laphroaig). Even better, include the whisky in an Earl Grey tea jelly and add jelly dice to the salad just before serving. A classic sweet is a chocolate cake with a candied orange and marmalade sauce, to pair with a Glenfarclas 15 Year Old or Aberlour a'Bunadh. A duck à l'orange will require the dual presence of peat and Sherry from an Ardbeg Uigeadail for instance. Whisky marmalades sold in distillery shops are often disappointing. You get the orange but the whisky has vanished (if ever included in the recipe). If you want to taste a real whisky marmalade, seek out Mary-Ann Mackinnon's thin-cut marmalade from Islay. Mary-Ann and Graham make it in their laboratory behind their shop in Bridgend. Hand cut, handmade and hand labelled, the peated version includes Laphroaig 10 Year Old and the unpeated one Bruichladdich Classic. That smoky orange infusion is a real delight. Last year, Mary-Ann had an order of 4,000 jars from Laphroaig to be shipped to Australia. The distillery has just ordered 2,000 more for the spring. A thriving success for this little Hebridean gem.